The Capital Direct I Income Trust opens select opportunities to investors like you. Share in the success we've built since 2006. You can take advantage of our proven mortgage and real estate expertise. Capital Direct is one of the fastest growing, non-traditional private lending companies in Canada specializing in home equity and residential mortgage financing. To find out more about Capital Direct, visit our retail web site at www.capitaldirect.ca. Find out how you can take part in Capital Direct's investment of choice. With better investing, your plans can become reality sooner than you might think. Investment options offered by banks may not grow fast enough to achieve your financial goals. Capital Direct I Income Trust contains a blend of mortgages carefully selected based on stability, security, and financial worth. 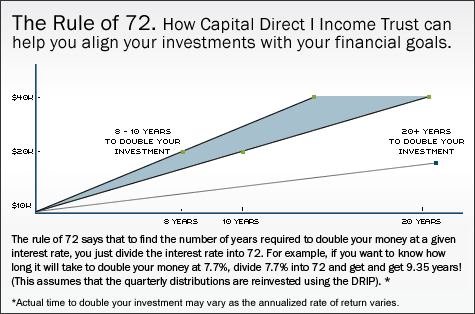 The Capital Direct I Income Trust is 100% RRSP, RRIF, RESP & TFSA eligible. It is an ideal investment for your medium and long term goals. Participate in an investment option that takes advantage of the strength of the real estate market and offers attractive returns. Whether you are saving for retirement, a child's education, or simply want your registered or non-registered savings to grow, the Capital Direct I Income Trust can put your savings into high gear and help you achieve your goals. This is an investment you will be proud to tell your family and friends about! * Annual return is based on 2018 income produced by Class A Units of the Trust. ** Ten - Year Historical Return as of December 31, 2018, is based on the income produced by Class A Units of the Trust after any voluntary reduction in Management fees or Income Participation. Past performance is not an indication of future returns. All investments carry risk. All subscriptions for the purchase of units are made pursuant to available exemptions. Depending on what exemption is being relied upon, a purchaser will receive the appropriate risk acknowledgement and an Offering Memorandum. Sales of units in BC can be made directly with Capital Direct Management or through a Financial Advisor or on-line brokerage firm. Any sale of units in Alberta, Saskatchewan, Manitoba, Ontario or Quebec must be conducted through a Financial Advisor or on-line brokerage firm. Sales of units in BC can be made directly with Capital Direct or through a Dealer/Advisor. Alberta, Saskatchewan, Manitoba, Ontario and Quebec subscriptions must be made through a Dealer/Advisor.